The math doesn’t lie. The published numbers from the government have been fairly accurate on deficit spending. As can be seen with graphic above, the government does in fact have a spending problem. When you are spending more than 1 trillion dollars than you take in, spending must be cut. And I am not talking about programs that haven’t been implemented yet. Real, substantial cuts must be made. Entitlement programs must be cut, defense spending must be cut, budgets must be cut, non essential/redundant programs must be cut, and spending that is state specific must be cut. 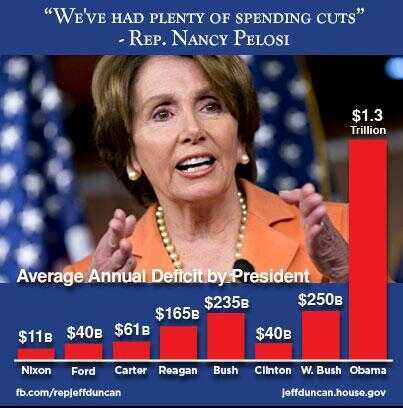 I also believe that until the budget is balanved, with a debt reduction plan in place, we must cut all foreign aid. As a family man, I know my family must have their needs taken care of before helping others. If we could take real steps and have real discussions in DC, we would be in a better place in America. It’s time to put pet projects and partisan politics aside. Do what is right for the whole country.